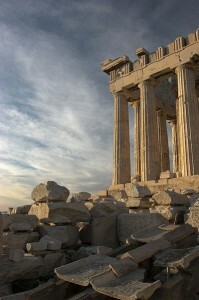 I was thinking today about Greece and the problems it faces. Should the European Union bail out Greece with large sums of money? No, the EU shouldn’t but the entire world should. Python fans will recall the moment in The Life Of Brian when the question “What have the Romans ever done for us?” was asked. Just transpose Romans to Greeks and you’ll see where I’m going with this. If you think about it for a moment, the world owes Greece a massive favour. Almost everything you see, do or touch today will owe something, somehow to Greece. The Greeks gave us western civilisation, democracy, mathematics, philosophy, medicine, geometry and much, much more. These innovations affect everything. They may have stood on the shoulders of a few giants to do so but what we have today is largely thanks to Greece. And while we’re at it, how about the United Kingdom returns the Elgin Marbles to where they belong. Every little helps. This entry was posted in Misc and tagged bail out, eu, greece on 2011-10-20 by pete.